May 8, 2014 -- New York Sea Grant is funding research by Cornell University to better understand the impact of viral hemorrhagic septicemia virus (VHSV) on an economically and ecologically important sportfish, the muskellunge. 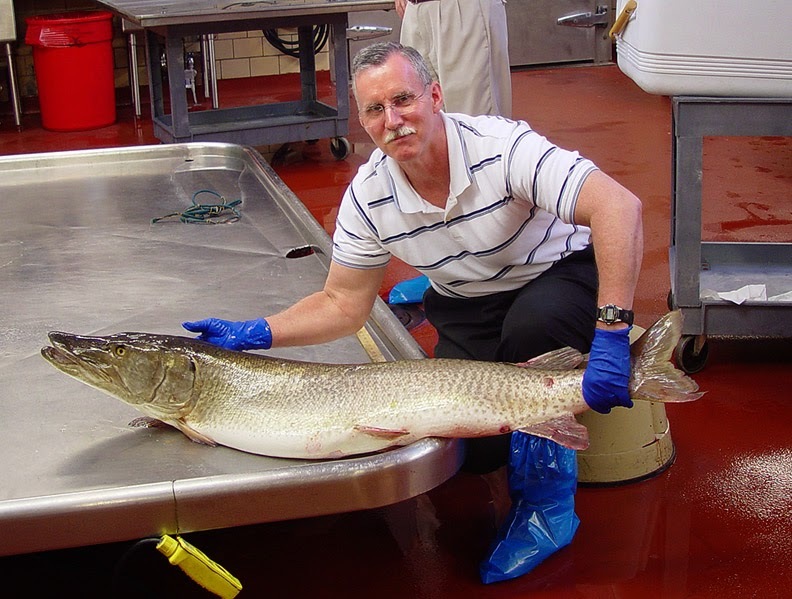 Dr. Rodman Getchell of the Cornell University Aquatic Animal Health Program will examine the interaction between VHSV and muskellunge fish population genetics to advance understanding of the relationship between VHSV virulence levels and the fish’s susceptibility to the disease. Project results will help managers and policymakers protect the $1.2 billion/year freshwater sportfisheries of New York. In the upper St. Lawrence River region of New York State, the muskellunge sportfishery has not yet recovered from the VHSV epidemic basinwide in the Great Lakes in 2005-2008. The disease has hindered population growth of the fish that is a significant predator in the aquatic food web. Anglers eagerly seek muskellunge because of the species’ large size – occasionally more than 60 lbs. – and its tremendous fighting ability. The St. Lawrence River muskellunge fishery attracts angler from all over the world. “Sampling in the summer of 2013 showed the virus was still present in the St. Lawrence River. This summer we will test muskellunge as well as other species to see what effect the long winter may have had on possible disease outbreaks this spring,” Getchell says. Young-of-the-year are fish that are less than a year old. An invasive species may indirectly be sustaining the VHSV threat to the muskellunge. “Round goby, a known VHSV carrier, has increased in abundance in nearshore areas and may have effects on regional fish communities, including a significant decline in the Tessalated darter, a small fish that is an important food source for young-of the-year muskellunge,” Farrell says. The researchers stress that VHSV is still in the Great Lakes and capable of killing fish and that monitoring is important for tracking the virus levels and locations. Getchell says Cornell-diagnosed VHSV outbreaks in Irondequoit Bay, east of Rochester, and at the mouth of Chautauqua Creek in Western New York in the spring of 2013 were the first fish kills caused by VHSV in New York state since 2007. More recently, a large fish kill due to VHSV was documented in March 2014 in Dunkirk Harbor, NY, on Lake Erie. New York Sea Grant, a cooperative program of Cornell University and the State University of New York, has been granted nearly $2.4 million in National Oceanic and Atmospheric Administration (NOAA) funding for several research projects focused on prevalent Great Lakes and marine issues in New York State. “Sea Grant’s approach of linked research, outreach and extension programs target issues of immediate relevance to New York State and its coastal communities,” said New York Sea Grant Interim Director Bill Wise. New York Sea Grant is one of 33 university-based programs under the National Sea Grant College Program of NOAA. The Program engages the nation’s top universities in conducting scientific research, education, training, and extension projects designed to foster science-based decisions about the use and conversation of aquatic resources. New York Sea Grant has been promoting coastal vitality, environmental sustainability, and citizen awareness about New York’s marine and Great Lakes resources since 1971. Find research reports, project updates, newsletters, RSS, Facebook, Twitter and YouTube links at www.nyseagrant.org. 1 Comment to " New Study Evaluating VHSV Impact on Muskellunge Sportfishery"
At present, India is at the front position in the medical world. Top Cardiology Hospitals in India has taken place due to the advancement in technologies. The clinic is bench-marked with creature comforts that include dialysis, chronic kidney care, renal surgery, kidney transplantation, etc.